The development could have important implications for Duterte’s remaining time in office and Philippine politics more generally. An interesting question is the impact Arroyo will have on the legislative priorities Duterte intends to advance. Arroyo was quick to declare her intent to implement Duterte’s legislative agenda. During her first day as House Speaker, in fact, she facilitated the approval of the Bangsamoro Organic Law, a key legislative measure which Duterte said will bring peace to the southern island of Mindanao. Arroyo’s reaffirmation of support to Duterte would definitely seem to boost the president’s appeal for the urgent passage of political reforms which he reiterated during his third state of the nation address on July 23. These are important agenda items not just for Duterte, but for Philippine politics more generally. Some of his proposals include the overhaul of the tax system, the banning of labor contractualization, the review of mining operations, and the speedy prosecution of corrupt government officials. But these issues were not highlighted in many news reports outside the Philippines. Part of that was due to the continued focus on Duterte’s defending of the government’s decision to continue the controversial and ‘chilling’ war on drugs, which has brought understandable scrutiny. Naturally, government critics have warned that this could lead to more drug-related killings and the intensified deployment of police in urban poor communities. Duterte also mentioned in his speech that the draft proposal outlining the country’s shift to a federal form of government is already finished. He added that he will follow what is mandated by the Constitution which many interpreted as a directive to Congress to initiate proceedings that would allow the country’s transition to federalism through constitutional reform. That would no doubt be a significant development that will determine Duterte’s political legacy and the country’s political future. Related to this, many supporters of federalism welcomed the election of Arroyo as House Speaker since this could hasten the campaign for charter change. 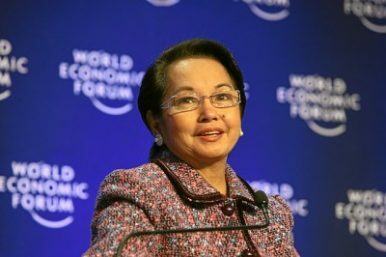 Aside from being a close ally of Duterte, Arroyo supported the proposal to replace the 1987 Constitution when she was president. But her government failed to carry out this ambitious goal because of the fierce resistance of the opposition and a broad segment of the population. This was also the time when her presidency was hounded by corruption scandals which eroded support for her political party in the 2010 election. Today, Arroyo is probably more likely to realize her unfulfilled plan to change the constitution with the political backing of Duterte. And the prospect of Duterte working in tandem with Arroyo in restructuring the country’s political system via a constitutional change has alarmed the opposition, activists, and human rights advocates. Though the differences are clear between the two individuals, the similarities are nonetheless worrying enough. Both Duterte and Arroyo are accused of committing widespread human rights violations. Both are allies of the family of the late dictator Ferdinand Marcos. Both wanted to remove the term limits of elected officials and the restrictions on foreign ownership of lands and domestic corporations. Speaker Arroyo could persuade both the House of Representatives and the Senate to call for a constituent assembly and amend the constitution according to the draft document prepared by the Duterte government. This could legitimize not just the extension of term for elected officials but also the expansion of powers of the office of the incumbent president. In other words, there is a risk that Arroyo’s election as Speaker could further weaken the country’s struggling democracy while entrenching authoritarianism. This scenario would benefit both Duterte and Arroyo for their own reasons. But this could also lead to an eventual conflict between powerful political blocs supporting the two influential leaders. Allies of the former speaker, who are also Duterte supporters, could still challenge the leadership of Arroyo, and this power struggle might delay efforts to amend the constitution or the passage of the government’s priority bills. If on the other hand, Arroyo succeeds in consolidating her power in Congress, she can emerge as a potential threat to Duterte and the ruling party.